刘玉, 朱德强, 高薇. 白花丹素对人类风湿关节炎成纤维样滑膜细胞凋亡的影响[J]. 中国药理学通报, 2018, 34(8): 1126-1132. LIU Yu, ZHU De-qiang, GAO Wei. Effects of plumbagin on proliferation and apoptosis of fibroblast-like synoviocytes in rheumatoid arthritis[J]. Chinese Pharmacological Bulletin, 2018, 34(8): 1126-1132. Abstract: Aim To evaluate the proliferation and apoptosis effects of different doses of plumbagin (PLB) on LPS-stimulated human rheumatoid fibroblast-like synoviocytes (FLSs) and explore the underlying mechanism. Methods FLSs were isolated from primary syn-ovial tissues obtained from rheumatoid arthritis (RA) patients. Cell viability and proliferation were measured with MTT and colony formation test. The pro-inflammatory cytokines were assessed using ELISA assay. The cell apoptosis was detected by flow cytometry and Hoechst 33342 staining. 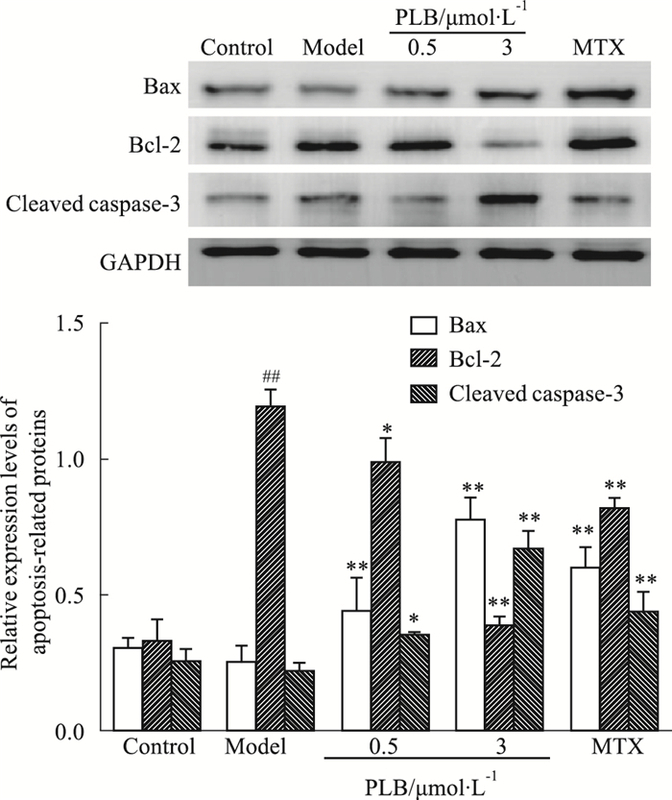 The protein expression levels of Bcl-2, Bax, cleaved caspase-3, p-JAK2 and p-STAT3 were detected with Western blot. Results Compared with model group, PLB dose-dependently inhibited LPS-induced cell proliferation ability of human RA FLSs in vitro (P < 0.05). 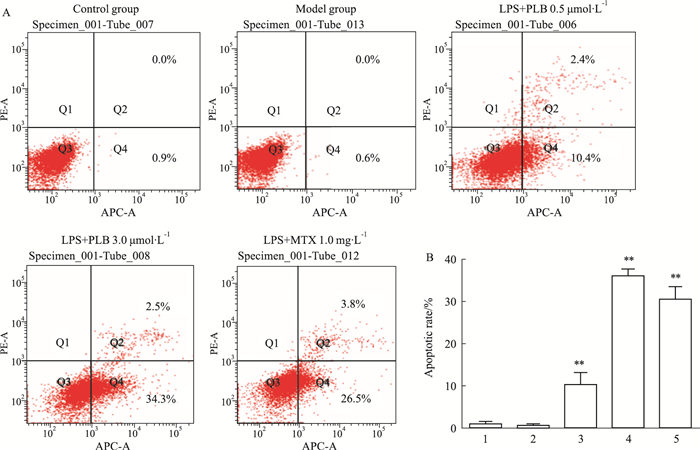 Flow cytometry and Hoechst 33342 staining showed that PLB and MTX significantly promoted apoptotic cell percentage in LPS-stimulated RA FLSs (P < 0.05). ELISA showed that the LPS-stimulated production of TNF-α and IL-6 decreased after PLB and MTX intervention compared with model group(P < 0.01). After treatment with PLB(0.5, 3 μmol·L-1) and MTX(1.0 mg·L-1)in RA FLSs, the protein expression levels of Bax and cleaved caspase-3 obviously increased (P < 0.05), meanwhile, the expression levels of Bcl-2, p-JAK2 and p-STAT3 markedly decreased (P < 0.05). 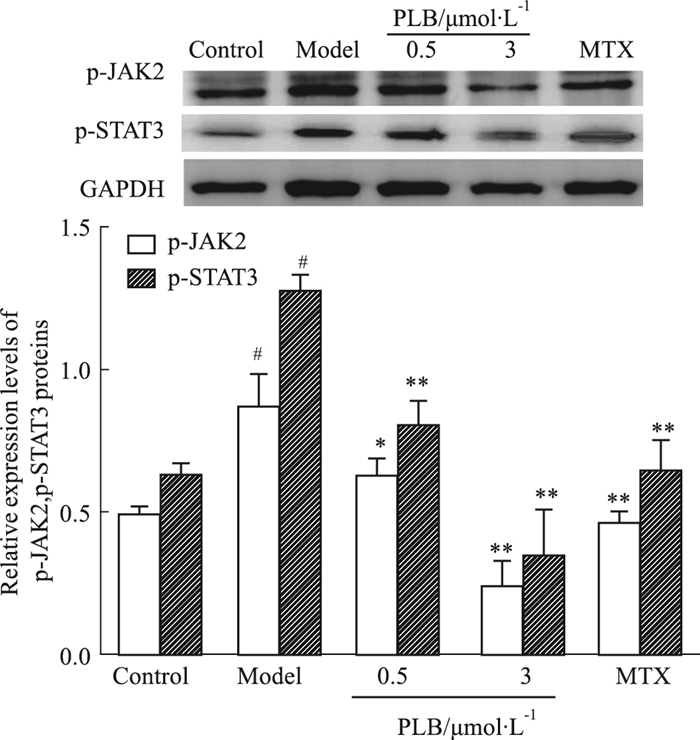 Conclusions PLB inhibits the growth and promotes the apoptosis of RA FLSs, which may be attributable to its down-regulation of JAK2 and STAT3 phosphorylation, and in turn its influence on apoptotic pathway of FLSs. Fig 2 Synovial fibroblasts isolated by enzyme digestion method in patients with rheumatoid arthritis(×200) A:A small number of cells were separated after cultured for 2 d; B:A few cells' proliferation after cultured for 7 d; C:The cell growth in good condition after replacing the medium. Fig 4 Effect of PLB on viability of RA FLSs(x±s, n=6) 1:Control group; 2:0.5 μmol·L-1 PLB; 3:1.5 μmol·L-1 PLB; 4:3.0 μmol·L-1 PLB; 5:Model group (1 mg·L-1 LPS); 6:LPS+0.5 μmol·L-1 PLB; 7:LPS+1.5 μmol·L-1 PLB; 8:LPS+3.0 μmol·L-1 PLB; 9:LPS+5.0 μmol·L-1 PLB; 10:LPS+7.5 μmol·L-1 PLB; 11:LPS+10 μmol·L-1 PLB; 12:LPS+MTX(1 mg·L-1). ##P < 0.01 vs control group; *P < 0.05, **P < 0.01 vs model group. 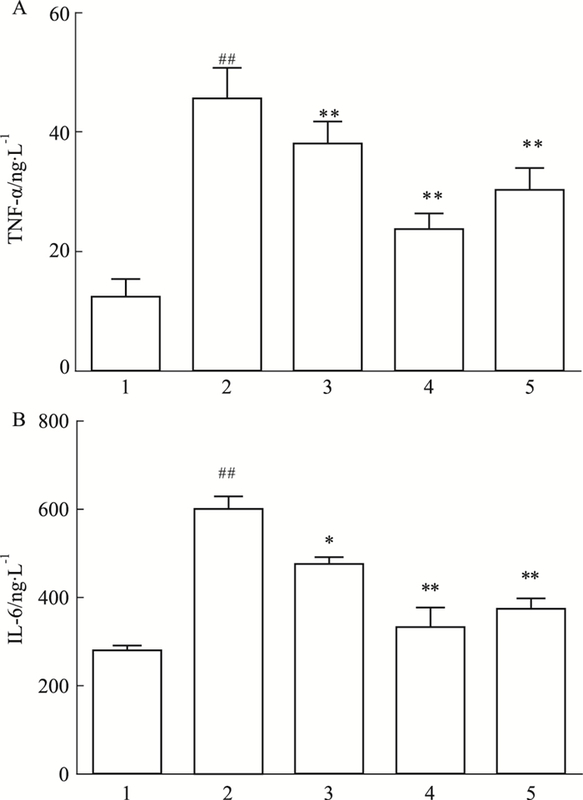 Fig 5 Inhibitory effect of PLB on LPS- induced TNF-α(A) and IL-6 (B) levels in RA FLSs(x±s, n=3) 1:Control; 2:Model; 3:LPS+0.5 μmol·L-1 PLB; 4:LPS+3.0 μmol·L-1 PLB; 5:LPS+1.0 mg·L-1 MTX.##P < 0.01 vs control group; *P < 0.05, **P < 0.01 vs model group. 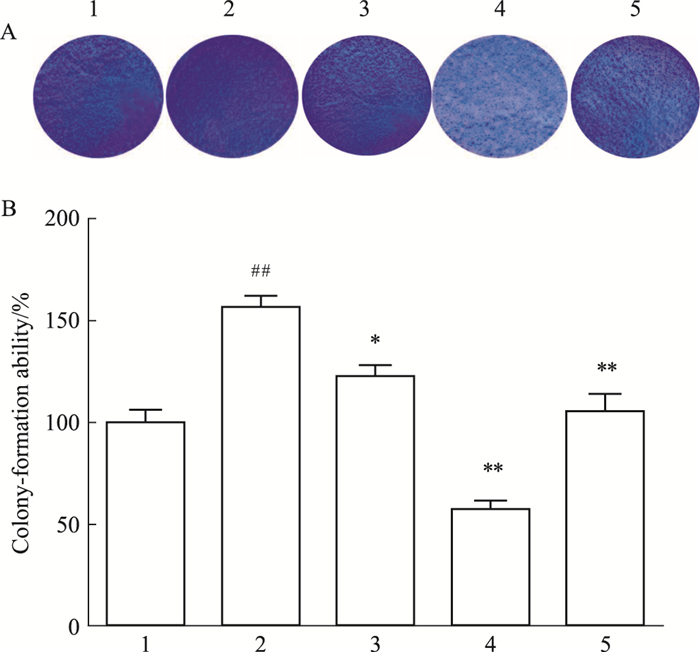 Fig 6 Effect of PLB on colony-formation ability of RA FLSs(x±s, n=3) 1:Control; 2:Model; 3:LPS+0.5 μmol·L-1 PLB; 4:LPS+3.0 μmol·L-1 PLB; 5:LPS+1.0 mg·L-1 MTX. A:The density of RA FLSs captured by camera; B:Bar graph of proliferation rate in RA FLSs. ##P < 0.01 vs control group; *P < 0.05, **P < 0.0 1 vs model group. Fig 8 Effects of PLB on apoptosis of RA FLSs(x±s, n=3) A:The apoptosis rate of RA FLSs; B:Bar graph of apoptosis rate. 1:Control group; 2:Model group; 3:LPS+PLB 0.5 μmol·L-1; 4:LPS+PLB 3.0 μmol·L-1; 5:LPS+MTX 1.0 mg·L-1. **P < 0.01 vs model group. 徐雅玲, 黄巨恩, 刘华钢. 白花丹素致体外培养肝细胞的损伤及改构型酸性成纤维细胞生长因子对肝细胞的保护作用[J]. 中国药理学通报, 2011, 27(6): 786-90. Xu Y L, Huang J E, Liu H G. Protective effects of MaFGF on plumbagin-induced injuries of rats' hepatocytes in vitro[J]. 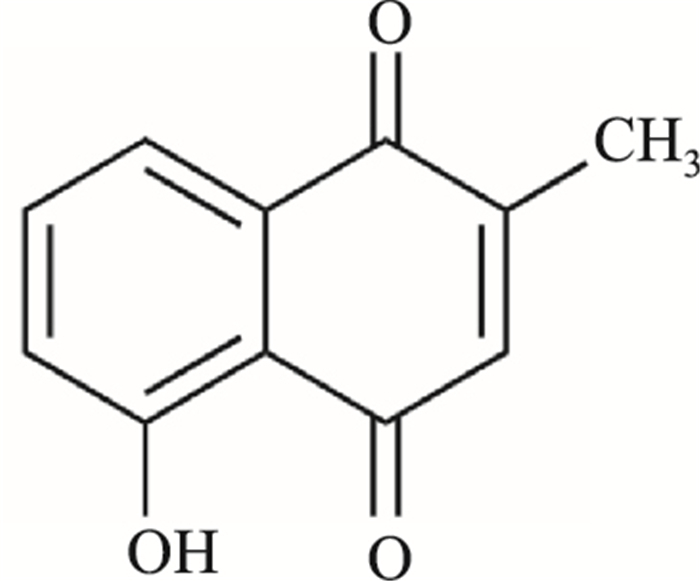 Chin Pharmacol Bull, 2011, 27(6): 786-90. 张红艳, 翟丽, 王婷婷, 等. 胡黄连苷Ⅱ通过抑制cyto C/caspase-9/caspase-3通路发挥神经保护作用[J]. 中国药理学通报, 2017, 3(5): 668-74. Zhang H Y, Zhai L, Wang T T, et al. Picroside Ⅱ plays a neuroprotective effect by inhibiting cyto C/caspase-9/caspase-3 signal pathway following ischemia/reperfusion injury in rats[J]. Chin Pharmacol Bull, 2017, 3(5): 668-74. 王亚媛. RNA干扰沉默STAT3对类风湿关节炎成纤维样滑膜细胞增殖/凋亡的影响[D]. 锦州: 辽宁医学院, 2014. Wang Y Y. Effects of siRNA-STAT3-mediated gene silencing on the proliferation and apoptosis of fibroblast-like synoviocytes in patients with rheumatoid arthritis[D]. Jinzhou: Liaoning Medical University, 2014. Chinese Pharmacological Bulletin, 2018, 34(8): 1126-1132.